Make Us Your CeleBEARation Destination! We’re the one-stop shop for everything you need to make it a celebration to remember! We have parties for any occasion — birthdays, team-building outings, troop parties, charitable events and more. Make your party plans today! Just pick the package that fits your budget and invite your Guests – Build-A-Bear Workshop does the rest! We provide a Party Leader who will guide the fun with hands-on activities and games. And each Guest creates the best party favor ever — their own furry friend to bring home and love! Make and take home a furry friend – best party favor ever! Party-planning made simple — with zero clean-up! Every Build-A-Bear Party Package is full of energy, creativity and fun! Build-A-Bear Workshop Parties are fun for any occasion! Theme ideas from Princess Parties to Movie Parties! Besides birthday parties, we host office team outings, scout troops, school groups and more. Make your party extra special with invitations, decorations and more! Build-A-Bear Workshop Parties — CeleBEARate Any Occasion! Make their special wish come true! Play outside the box with a one-of-a-kind team-building experience. Have fun giving back! Make and donate furry friends to a charity of your choice to make a difference in your community. Gather the troops for a unique, hands-on experience — and be prepared for fun! If your school, summer camp or daycare is looking for a special treat, Build-A-Bear delivers! Bring your Guests together before or after store hours for a private celebration to remember. 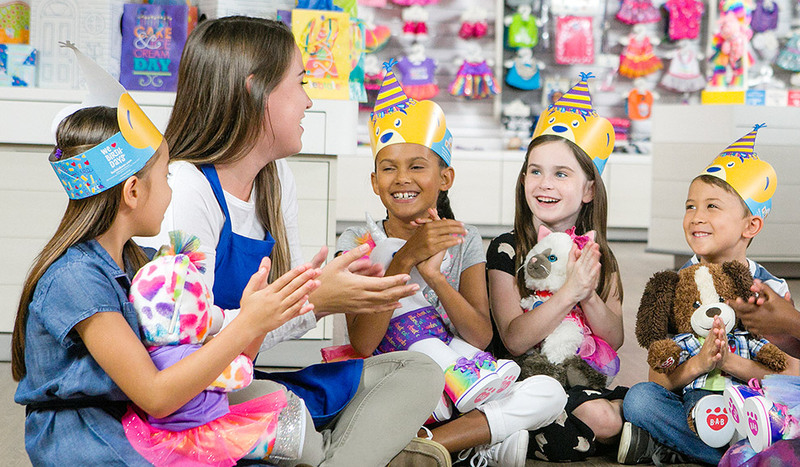 A Build-A-Bear party is perfect for a special day — or any day!